The USDA defines a food hub as a “business or organization that actively manages the aggregation, distribution and marketing of source-identified food products primarily from local and regional producers to strengthen their ability to satisfy wholesale, retail, and institutional demand”, but food hubs do much more. Food hubs are a catalyst for community wellness. They address problems of food insecurity and connect community members to the source of their food. Building a regional food hub requires collaboration of multiple partners. Each partner contributes unique strengths and resources to the project. Community stakeholders amplify success by participating in project planning and execution and supporting the food hub in their community. In 2018 the Ohio State University’s Initiative for Food and AgriCultural Transformation (InFact) partnered with the Methodist Theological School in Ohio (MTSO), Seminary Hill Farm, and Franklinton Gardens Urban Farm, to develop a model for food hub businesses in underserved urban communities. 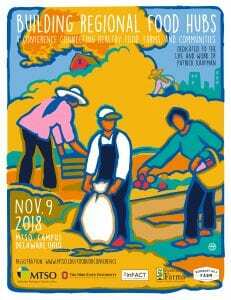 The organizations invite community stakeholders, individuals and organizations to attend the Building Regional Food Hubs Conference on Nov. 9, 2018. The conference will host local food leaders from across the state of Ohio. Anna Haas from Local Food Connection will share online possibilities for urban food hubs. Piper Fernway will describe how Bon Appetit Management Company connects institutions to local food in Appalachia. Leslie Schaller, the founder of the Appalachian Center for Economic Networks’ (ACEnet) Food Venture Center and Nelsonville Food Hub, will tell how ACEnet helps producers enhance their businesses with value-added products. The conference will feature a panel of practitioners discussing challenges and opportunities for producers in food hub models. Panelist Tadd Petersen, manager of Seminary Hill Farm, notes that producers face many challenges. Tadd says, “Storage is the number one barrier facing producers.” Food hubs can provide aggregation, packing, processing and storage space to help farmers expand business capacity. Seminary Hill Farm works with 30 local farms to provide catering and event services, supply MTSO’s dining facilities with farm fresh food, and operate a 300-member Community Supported Agriculture (CSA) subscription. A tour of Seminary Hill Farm will follow the conference. Time: 9 a.m. to 4 p.m.
1. Barham, James, Debra Tropp, Kathleen Enterline, Jeff Farbman, John Fisk, and Stacia Kiraly. Regional Food Hub Resource Guide. Washington, D.C. U.S. Department of Agriculture, Agricultural Marketing Service. April 2012. Think a co-op may be part of the solution for your farm or food business? Now is the time to get involved and/or come to ask questions. Location: WVU Kearneysville Tree Fruit Research and Education Center, 67 Apple Harvest Drive, Kearneyville, WV. 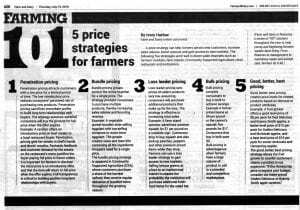 Determining a price for farm products that attracts consumers and creates profits for producers can be a challenge. 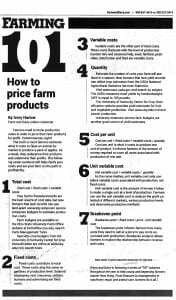 A three-part Farming 101 series of articles in Farm & Dairy Newspaper helps farmers calculate costs, conduct price research and implement a price strategy to increase farm sales and revenue. 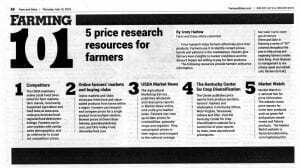 Click article to visit Farming 101 Archives. Cooperatives are businesses owned by the people they benefit. They exist in every major industry and are common in food and agriculture. Co-ops provide members with sustainable solutions. They help farmers gain access to larger markets, boost product quality, reduce costs and achieve greater efficiency and operational effectiveness. 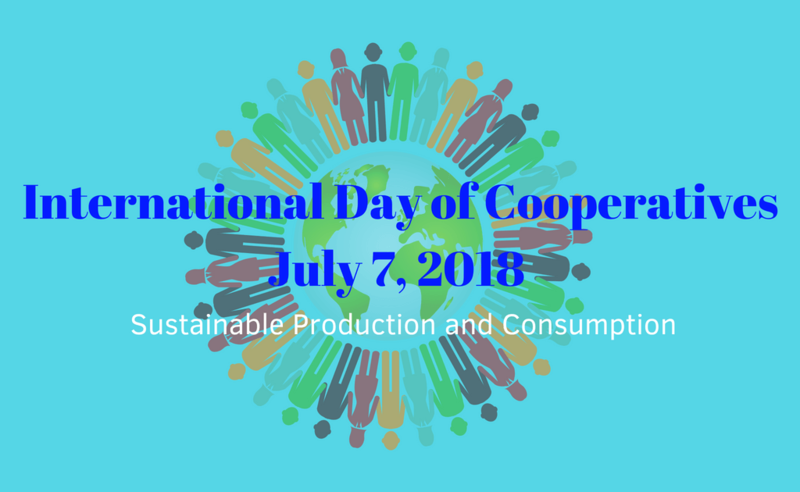 On the International Day of Cooperatives farmers everywhere tip our hats to recognize these and other cooperative businesses’ dedication to sustainable consumption and production. United Nations General Assembly. (1987). Report of the world commission on environment and development: Our common future. Oslo, Norway: United Nations General Assembly, Development and International Co-operation: Environment. 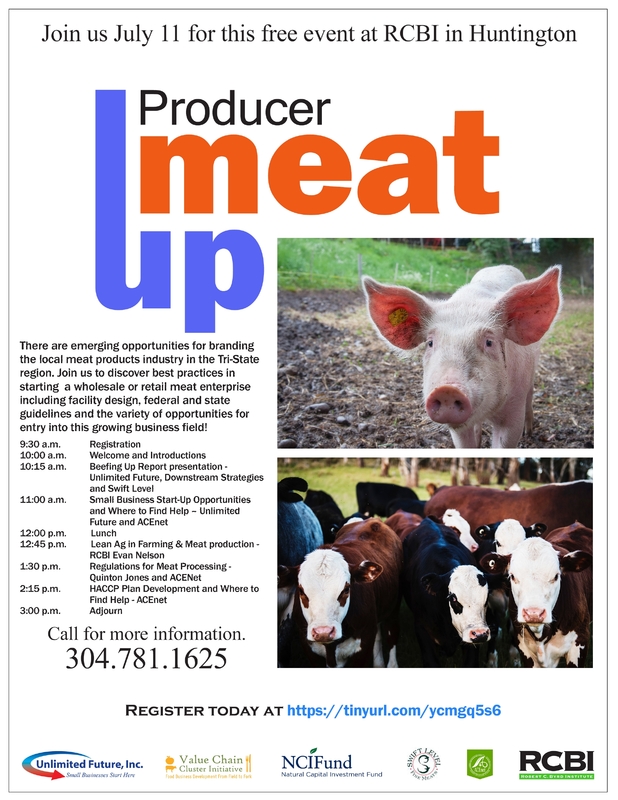 Learn how to start a wholesale or retail meat enterprise at the Producer Meat Up. Presented by: Unlimited Future, ACEnet, Downstream Strategies, VC2, Swift Level Meats and Robert C. Byrd Institute (RCBI). Time: 9:30 a.m. to 3 p.m. Cost: Free. Lunch is included. The Ohio State University College of Food, Agricultural, and Environmental Sciences Center for Cooperatives launched Co-op Mastery: Beyond Cooperatives 101, a new and innovative online training course designed to educate cooperative members, boards, management, employees, and students. Co-op Mastery: Beyond Cooperatives 101 is made possible by a grant from the CHS Foundation 2017 Cooperative Education Grants Program. The training is housed in The Ohio State University’s public-facing online education platform. It is free and can be accessed online at go.osu.edu/coopmastery. Caption: Co-op Mastery is a new online learning tool launched by The Ohio State University College of Food, Agricultural, and Environmental Sciences Center for Cooperatives. Logan County Electric Cooperative General Manager Rick Petty discusses cooperative principles and various functions of cooperatives. Dennis Bolling retired President and CEO of United Producers Cooperative shares the benefits cooperatives provide members. Mid-America Cooperative Counsel Executive Director Rod Kelsay discusses effective education and training the Board of Directors. Ohio State Univerisity Extension Educator Dr. Chris Bruynis gives insight to key factors that contribute to a cooperative’s success. Nationwide’s VP of Sponsor Relations Devin Fuhrman shares the story of Nationwide’s history as a mutual cooperative company. Agricultural attorney Carolyn Eselgroth of Barrett, Easterday, Cunningham and Eselgroth, LLP addresses legal considerations when forming a cooperative business. Co-Bank Senior Relationship Manager Gary Weidenborner leads users through an interactive financial document exercise. David Hahn, Professor Emeritus the Ohio State University, explains cooperative taxation. The CFAES Center for Cooperatives offers customized in-person workshops to complement the online training. Workshops are designed to serve the requesting cooperative’s needs. Examples include: new employee education, board of director education, strategic plan development, cooperative marketing and policy development. Workshop participants receive a companion workbook with activities to fortify learning. They gain on-going access to Co-op Mastery online training materials, which they may work through at their own pace or search for specific information to meet immediate needs. Users can return to the Co-op Mastery online materials at any time to troubleshoot cooperative issues and they can receive ongoing technical assistance from CFAES Center for Cooperatives staff. To request a workshop or more information, visit go.osu.edu/cooperatives or contact the Center for Cooperatives at osucooperatives@osu.edu or 740-289-2071 ext. 111. The morning began with a hearty cowboy breakfast, then we saddled the horses and hit the trails. We buckaroos rode over rolling hills and crossed trickling creeks. When the afternoon sun grew hot, we rested the horses under a shady canopy of trees. That evening we were treated to a chuck-wagon dinner around a campfire, complete with s’mores and cowboy poetry. It was a perfect day made possible by agritourism. My husband and I are diehard agritourists. Each summer we visit a local u-pick blueberry farm in South Bloomfield, Ohio. I buy plenty of berries to eat fresh and freeze. In fall we attend Hirsch’s Annual Apple Harvest Open House. We ride the hay wagon to the peak of the property and gaze down at the apple orchard below. The beautiful view still takes my breath away — even after six seasons attending Hirsch Fruit Farm’s agritourism event! Agritourism activities are an opportunity for producers to start, grow or expand their agribusinesses. Consumers awareness and interest in how food is produced is increasing. Agritourism is a wonderful way to deepen farmers’ connection to customers, educate the public on food production and offer an enriching family-friendly activity to members of the community. Agritourism also is a business diversification strategy. A pumpkin grower can add a pick-your-own pumpkin patch. Hops and wine grape growers can host locally produced beer and wine tastings at their yard or vineyard. Producers can complement their current offerings with an agritourism activity; a grower of specialty crops can partner with a local chef to cook up a farm-to-table dinner. Spirits, Beer, and Wine, Oh My! The conference is being presented by the Ohio State University Extension Direct Food and Agriculture Marketing Team, The Resource and Ag Law Program, Wright & Moore, LPA, and The Ohio Farm Bureau and Pike County Farm Bureau. 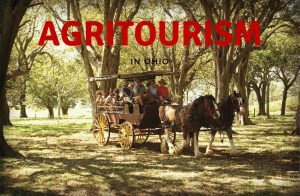 The second annual Ohio AgritourismReady Conference we be held March 10, 2018 at the OSU South Centers Endeavor Center in Piketon, Ohio. Registration is required as space is limited. For more information or to register contact gardner.1148@osu.edu or 740-289-2071 x. 132. Deadline to register is March 2. The registration fee is $25/person. Farm Bureau members can receive a $5 discount. The CFAES Center for Cooperatives will host a lecture at 3 p.m. on Thursday, March 1 presented by Scott A. Shearer, PhD, Professor and Chair, Department of Food, Agricultural and Biological Engineering, The Ohio State University. 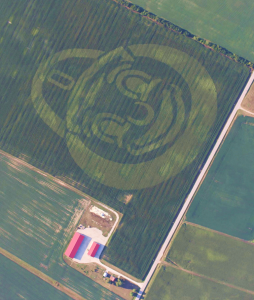 Dr. Scott A. Shearer will present a lecture on using precision agriculture data, issues of ownership and control, and the potential applications of using this data to help decrease agriculture’s environmental impact. Dr. Shearer received formal training in agricultural engineering from The Ohio State University. During his nearly 30-year career in academia, his research efforts have focused on controls and methodologies for metering and spatial distribution of inputs (seed, fertilizer, and chemicals) for precision cropping systems. His current research activities include: modeling of current and future field machinery systems; autonomous, multi-vehicle field production systems; UAS for remote sensing; yield monitoring strategies; precision seeding technologies and management of production agriculture data. 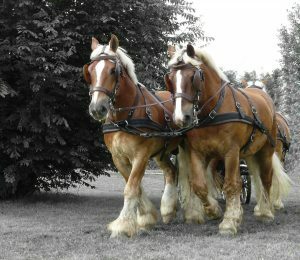 Among draft horses, Belgians are reputed to be the strongest and most capable. 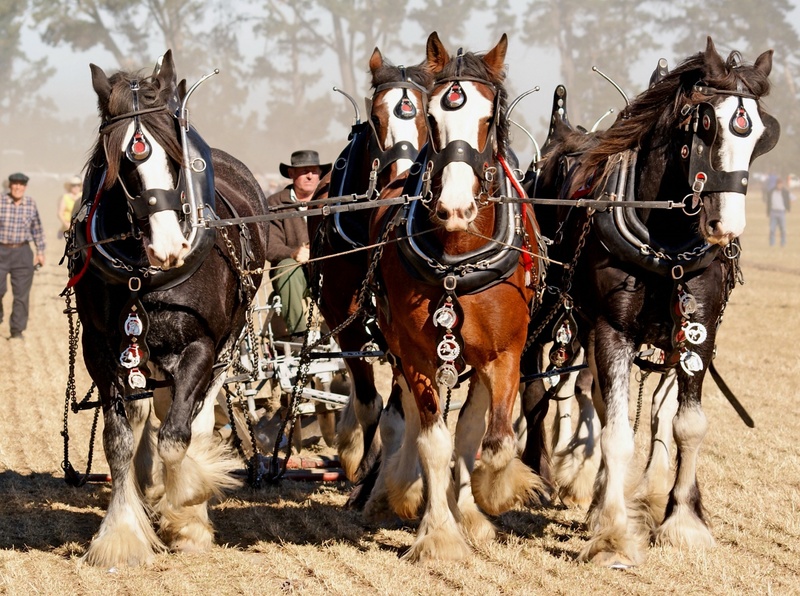 A single Belgian draft horse can tow 8,000 pounds. 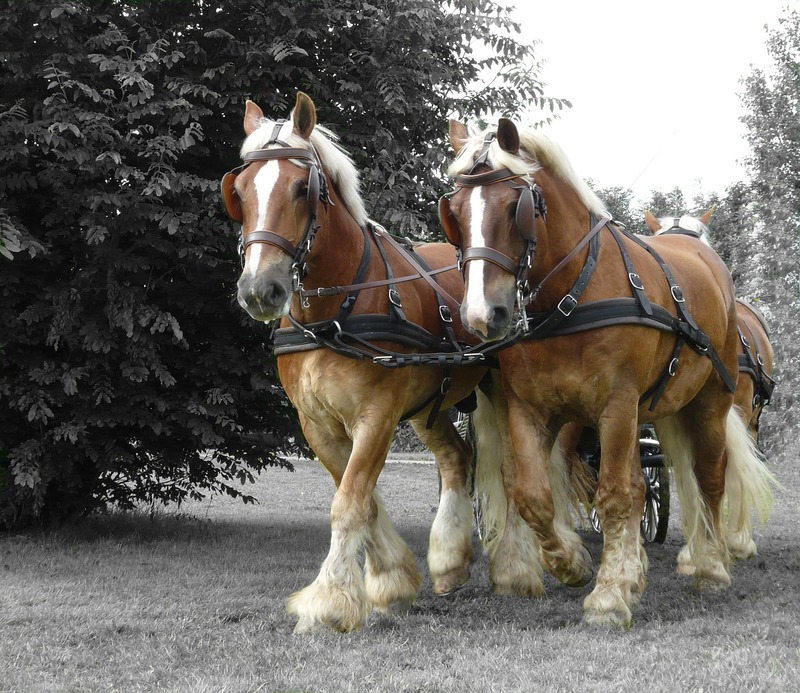 More impressive is what two can do together; a team of two draft horses doesn’t just double- but triples pulling power to 24,000 lbs! Like a team of draft horses, The CFAES Center for Cooperatives combined forces with industry, government and association partners to achieve great things in 2017. 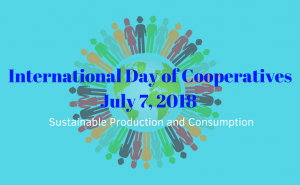 Collaboration created greater impact through cooperative education, technical and development assistance for stakeholders and students of cooperatives. The Center teamed up with the Mid-Ohio Foodbank to share best practices with the Ohio and West Virginia Food Hub Network. Director of Food Resource Development, Mike Frank, led network participants on a tour, describing how the Foodbank has overcome challenges associated with the aggregation, storage and distribution of fresh food. The Network left with practical actions to improve their food hubs’ operational efficiency. Collaboration between the Center for Cooperatives and the United States Department of Agriculture Rural Development provided valuable information to local ag producers looking to diversify or enhance their operations. A Value-Added Producer Grant informational session with key speakers from the USDA was hosted at the OSU South Centers, offering local producers an opportunity to ask questions and get answers from USDA grant experts. The Center for Cooperatives worked closely with the Central Appalachia Cooperative Development Group to start Unity Coffee and Teahouse, the first worker-owned cooperative business in Parkersburg, West Virginia. Five Baristas and a coffee roaster created the co-op with a shared vision to foster a commUnity that supports workers, customers and local residents. Unity Coffee and Teahouse opened for business in January 2018. The Mid-America Cooperative Council (MACC) brought together cooperative developers from across the Midwest to facilitate communication and coordination of co-op educational resources. The Center met with counterparts from Kentucky, Indiana and northeast Ohio at United Producers, Inc. headquarters in Columbus for a two-day roundtable. Developers discussed programming, goals and alignment. The Center identified opportunities to boost educational programming and technical assistance in the region by sharing knowledge and pooling resources. The Center facilitated cooperative education for visiting scholars in the Department of Agricultural, Environmental, and Development Economics over their stay in the United States, including an educational tour of agricultural cooperatives at the Farm Science Review. Scholars visited with representatives from Ohio’s Electric Cooperatives, Farm Credit, Heritage Cooperative, Dairy Farmers of America and COBA/Select Sires. The scholars returned to Ukraine motivated to share their newfound knowledge of agricultural cooperatives with students at their respective universities. The Center connected with local vocational schools and FFA to build students’ awareness of careers in agricultural cooperatives. The Center hosted students at OSU South Centers, visited Ohio Valley Career & Technical Center FFA and served on an Ag Career panel in Ross County. The Center worked with the Ohio State University CFAES Department of Agricultural, Environmental, and Development Economics instructors to facilitate an undergraduate class project. Students interviewed cooperative leaders and created multimedia presentations sharing what they learned about the cooperative model. Collaboration with partners created a great impact in 2017. The CFAES Center for Cooperatives intends to increase our horse power in 2018. We look forward to partnering with the Ohio Farm Bureau to provide cooperative education to the next generation of leaders at the AgriPOWER Institute and the Young Agricultural Professionals Winter Leadership Experience. The Center will forge new relationships with growers, producers and marketers at the annual Ohio Produce Network conference, the Ohio Association of Meat Processors conference, and the 14th Annual West Virginia Small Farm Conference. Together, the Center and partners are resolved to drive forward the cooperative movement in the region and beyond. The average farm in West Virginia is 175 acres. Farmers face several barriers to operate a successful small farm enterprise. Achieving profitability with limited production yield on less land is a major challenge. Farmers have fewer options to diversify small operations. They experience difficulty finding the right market mix and scaling production to serve larger markets. Additionally, lack of infrastructure and distribution are common barriers. The 14th Annual West Virginia Small Farm Conference offers solutions to unlock the potential of West Virginia small farms to produce food profitably. The conference will take place February 21-24, 2018 at the Morgantown Event Center in Morgantown, West Virginia. The goal of the conference is to help farmers develop a successful small farming enterprise by providing reliable, tested knowledge about current trends, needed skills, and latest production and operation information. 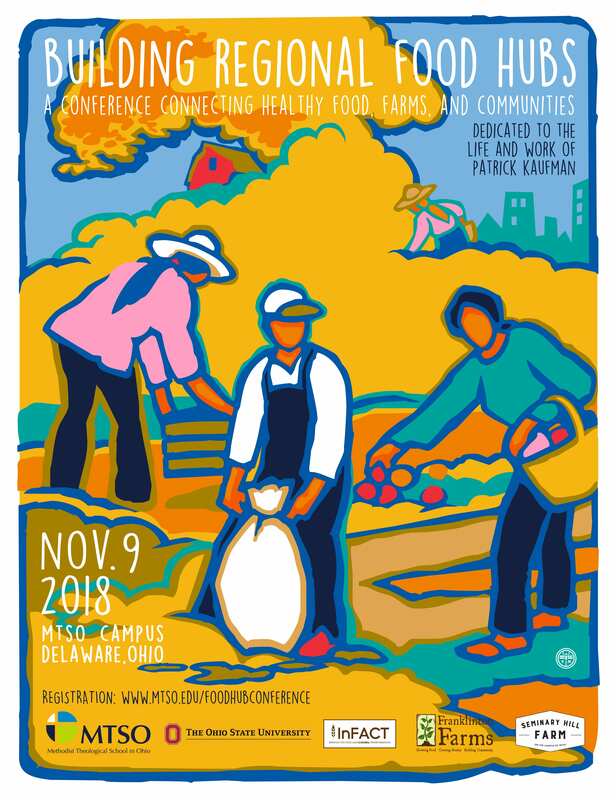 The conference also aims to strengthen West Virginia’s food system by encouraging local production, processing, wholesale and retail marketing, and consumption. There will be a wide variety of educational workshops during the three-day event. 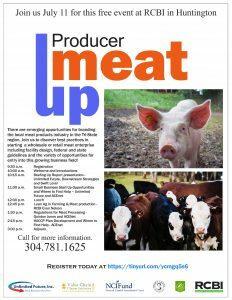 Farmers will learn about livestock, fruit, vegetable and specialty crop production. In-depth discussions led by experts in farm management, marketing, finance and risk, will benefit farm enterprises of all types. Food producers will learn how to add value to their farm products, utilize agricultural cooperatives to gain market access. Special sessions will highlight West Virginia’s Farm-to-School initiative, Farmers’ Markets and agritourism opportunities in the Mountain State. The Winter Blues Farmers Market will take place on Thursday, February 22, 2018, from 4-8 p.m. at the Morgantown Event Center. The community event is family-friendly and open to the public. The market will showcase local food, goods and products. Enjoy the aroma of delicious food cooking while browsing the market. Area chefs will be on-hand to prepare pay-as-you-go dishes and entrees with locally grown food. Cost: Registration is $70 per day, or $190/3 days for adults. Students, active military and veterans receive a discounted rate. Registration includes breakfast, lunch, snacks, Friday dinner, and conference materials. A $10 convenience fee increase per person per day for walk-in registrations. 2017 Annual West Virginia Agricultural Statistics Bulletin. No. 48. USDA National Agricultural Statistics Service, West Virginia Field Office. 2017. www.nass.usda.gov/Statistics_by_State/West_Virginia/Publications/Annual_Statistical_Bulletin/2017/Bulletin2017-All.pdf. Date Accessed 5 Feb 2018.